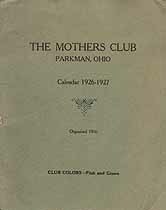 The Mothers Club, Parkman, Ohio, Calendar 1926-1927. Organized 1916. Names in this online transcription include Agler, Baird, Bancroft, Bidlack, Black, Blair, Browning, Charp, Cone, Conrad, Cromwell, Davison, Dickens, Donaldson, Farley, Fenton, Fram, Garber, Gardner, Gates, Giles, Hillock, Hosmer, Hoxter, Irwin, Johnson, Jones, Judson, Kaiser, Kerner, Lattimore, Linsley, Maynard, Milliken, Mitchel, Moore, Norton, Owen, Pealer, Pitner, Quinby, Randall, Stacy, Steffins, Tinker, Towne, Tucker, Urpi, VanWagoner, Waters, Watson, Welch, Williams, Wilson, Young. The Genealogy Today catalog number for this item is 15794. When inquiring about the information in this resource, please mention the catalog number.